The driveway off Pacific would go somewhere in this area of the planned Albany police station site. There’s been some question about access to and from the planned site of a new Albany police station on Pacific Boulevard S.W. (Highway 99E). Today there’s new information on that point from Ron Irish, the city’s transportation systems analyst. Irish reports that city officials discussed the driveway issue with ODOT officials including access management engineer Jim West in April. 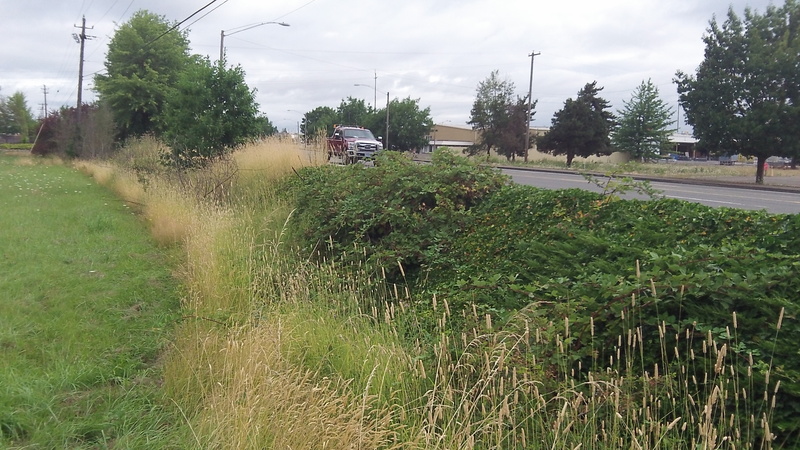 They learned that the agency would be willing to allow a full access driveway (left and right turns both in and out), but ODOT also suggested that a secondary access point be provided on Willetta Street, at the back side of the property. This would allow visitors to leave the station by the back way and to use the signal on 29th Avenue to get back on Pacific, which would avoid having to brave a left turn across fast-moving traffic. As for using Willetta as a secondary access to the police site, Irish says the traffic would be significantly less than if the site were developed for professional offices as the zoning allows.